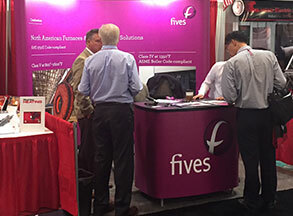 Fives and its Combustion teams presented North American furnace solutions focusing on temperature uniformity, low emissions and maintenance offerings. North American solutions guarantee uniformity performance per AMS2750E for furnace Classes I through VI using a variety of proprietary combustion systems and furnace geometry to meet and exceed the customer’s production, efficiency, and environmental needs. Fives then offers maintenance packages to keep furnaces reliable and within specifications for many years of productive service. Attendees came from automotive, aerospace, military, medical, heavy equipment, tooling, and agriculture. Exhibitors represented every aspect of heat treating including: furnace equipment, accessories, sensors, controls, compliance, chemicals, and oils.